Mission located in Delta-Quadrant with span: 4 and points: 30*. Special Instructions: * + 25 if all personnel in Away Team are . Affiliations: Any Away Team may attempt mission. 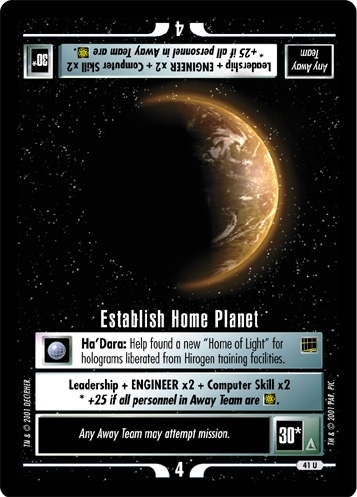 There are 20 entries for Establish Home Planet (ST1E 14 U 41) at the Tradeplace (35 haves and 6 wants). Click here to see all trade list entries for this Uncommon card! Also see here for all trade lists with any card fom "Holodeck Adventures".